As girls gone 50, we all know how important it is to use our experience and expertise to mentor young women. But here’s what’s just as valuable: Finding a young woman to mentor you. In other words, a reverse mentor. But we don’t just mean a digital native and sherpa to the Twittersphere who will help you with your social media, we’re talking about an IRL (in real life) relationship with a millennial who brings with her a new perspective, fresh ideas and a different world view that will help keep you #foreveryoung. Six months ago when we had the idea to start, Girls Gone 50, we had only a vague idea how to start a blog, much less successfully navigate the blogger universe which we imagined to be akin to navigating our way around Coachella in search of some shade and a nice, quiet place to sit down. So we sought out a reverse mentor in the person of Megan, a brilliant 37-year-old Columbia graduate and digital marketing expert who launched many a YouTuber’s career. Little did we know that we would soon be calling her like college freshmen away from home for the first time. Or that we’d come to treasure our lunches together in which our 25-year age gap was filled with laughter, sound advice on both sides, inspired brainstorming and amazing non-GMO farm-to-table bites at hipster restaurants. “Wow, that’s amazing,” you say. You were just thinking of asking your son’s college friend to help you with your Instagram feed! 1. Don’t just ask your kid’s friends if they’re up for it. The best reverse mentor is not just some youngster who will help you with the technical stuff of your website and social media. It’s someone who is invested for the longer term, who brings a fresh perspective to a project and who values your voice and your point of view. When we found Megan we hit the jackpot in finding a wise soul in a young woman’s spirit. 2. View your reverse mentor as a partner. Not a transaction. Reverse mentors aren’t just valuable for their technical expertise. They bring their own lens and set of experiences, which contributes a different worldview to the greater context. Their value is not just in showing you how to do something but helping you understand how something works. Megan’s tip: Building a successful reverse mentor relationship is a process, not a quick fix. If there’s one thing age has taught us is that we don’t know everything. So don’t be afraid to ask questions, even seemingly stupid ones e.g. “You mean, LOL doesn’t mean lots of love?" Megan’s Tip: I want to work with someone who knows that they don’t have it all figured out vs. someone who just wants to cross their t’s and dot their i’s on a plan they’re not willing to rework. The point of mentoring is not for an older person to teach a younger person. Or even vice versa. The point is to learn from each other and appreciate each other’s talents in service of creating something richer and more extraordinary together. This is how we keep from getting old and getting stuck in our respective ways. We get to understand and respect each other’s talents, values and thought processes by working together, not above and below, but shoulder-to-shoulder. Megan’s tip: Your reverse mentor should be getting just as much out of it as you are! I’m inspired every day by Girls Gone 50’s commitment to finding their voice and creating a community. Having a real relationship like this is how we will help reverse ageism. 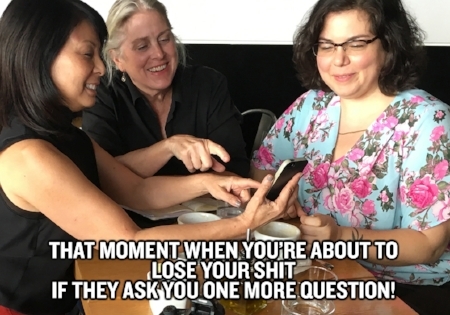 Besides, hanging out with Kathy and Susan has given rise to some really great mom memes.